If your after the BEST possible coverage on card magic. This set is it!! The descriptions are so very clear, step by step diagrams are most helpful for the difficult sleights and tricks. Why bother with volume 3? It details the more difficult sleights such as the multiple shift or the diagonal palm shift. Believe me, it helps immensely when you have a clear and instructive resource. I wish these books were out 10 or 15 years ago when I got started in magic, and more specifically, card magic. They are so well written and the illustrations are so crystal clear that you can't help but learn the moves in these books. I am really a visual person, and I love to learn from videos, but this set really makes it easy to learn from the pages of a book. The Zarrow Shuffle and the faro shuffle are worth the price of this book alone, but it is PACKED with great moves. I highly recommend the whole series! 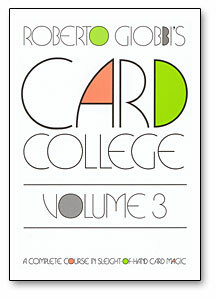 Card College is a Classic like Tarbell. These are must own books on Card Magic.